The House by the Fjord by Rosalind Laker. Severn House, 2011. The House by the Fjord is the last novel of the prolific romance writer Barbara Øvstedal (1921-2012), who wrote primarily under the pen name of Rosalind Laker. Her many historical romance novels, notably To Dance With Kings (about the court of Louis XIV), The Golden Tulip (about Vermeer), and The Venetian Mask (about orphaned music students in the Ospedale della Pietà in 18th century Venice), brought her much recognition and the chance to work with Jacqueline Onassis, her editor at Doubleday. She was born in Bognor Regis, West Sussex, England, to a Canadian father and English mother. In 1945, her life would change dramatically when she married Inge Øvstedal, a Norwegian who had escaped Nazi-occupied Norway by fishing boat in 1941. When she met him, he was stationed in West Sussex with the Royal Norwegian Air Force–the Norwegian air force in exile, which was fighting with the Allies and preparing for Normandy. In 1946, the young couple and their infant daughter moved to Gardermøen, Norway. This town figures prominently in The House by the Fjord, in which the heroine, Anna Harvik, arrives for the first time in Norway as a war bride. The time is 1946, the immediate postwar period, when Norway is still suffering the aftershocks of the brutal Nazi occupation; this was the year in which the author herself went to live in her husband’s native country. But the fictional Anna is alone. Her husband Johan has died in the war, and she is fulfilling the demands of kindness, duty, and a good measure of curiosity by accepting an invitation from Johan’s father to visit him and see her late husband’s boyhood home. The opening chapters of the book are very agreeably filled with Anna’s interactions with the close-knit group of war brides who have banded together to help ease their adjustment to living in a new country. They accept her quickly and many become her close friends, helping her learn to speak Norwegian, teaching her about local foods, even showing her the local dance steps. As much as she appreciates this warm reception, she keeps assuring everyone that this is only a visit and she will soon be returning to her home in England. Unruffled, the townsfolk nod and hold to their own opinion that once the healing beauty of Norway seeps into her soul, she won’t ever wish to leave it. … although I have never seen it, I feel drawn to it as if it has long been beckoning to me. … I have packed my belongings in my bridal chest. These include the bed linen and hand-woven blankets with the blue and white pattern that I brought to my marriage, but nothing that came from Berdal’s purse. I have also taken my father’s field gun, which he sold to Berdal once when he was desperate for money, and a box of bullets. When sober, my father was a good shot at bringing down ptarmigan and other game birds in season. He was also a skillful angler and taught me to fish, and indeed sometimes it depended on our catch whether we had something for our supper. So I am taking my rod and line, which as a birthday gift from him and with which I caught my first salmon, and many more fish since that day. Anna reads this account with growing excitement and the narration switches to third person, as if moving back into Anna’s reading experience, her own understanding of that first glimpse, along with Ingrid. Although this house near Molde is not as grand as Ingrid’s, it does have a turf roof, and the panorama of the fjord behind it. Anna is captivated by Ingrid’s strength and pluck, as well as her acceptance of herself as a woman still desirous of finding real love and sexual fulfillment with a better man. Ingrid meets and marries Magnus Harvik, who is already a famous painter of Norwegian landscapes, and thus she begins her life as mother and matriarch of the sprawling family that will lead in Anna’s time to her beloved Johan. Anna is well aware that her new friends are urging her to be open to the possibility that she might love again, and find that love in Norway. The rest of the story shows how she deals with questions of love and trust, of family and independence, of heritage and finding one’s true home. In the process, she also uncovers the sobering truth behind a mystery connected with the house, sparked by clues from Ingrid’s journal. Anyone who has loved Rosamund Pilcher’s novels set in Cornwall, in particular The Shell Seekers, would quickly warm to Rosalind Laker’s beautifully told story in The House by the Fjord. I’m eager now to read some of her other books, especially This Shining Land, about a woman who joins the Norwegian resistance, but I know this last novel of hers, closest to her own experience, will likely remain my favorite. An African in Greenland by Tété-Michel Kpomassie (trans. by James Kirkup, 1983; intro. A. Alvarez). New York Review Books, 2001. Tété-Michel Kpomassie is an extraordinary person and an extraordinary writer. 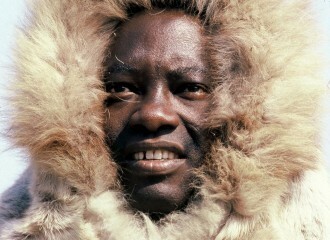 His decision to leave his native Togo in 1959 and travel alone to Greenland puts him among some of the most determined Arctic travelers of the last few centuries. His choice of destination is surprising, until one reads his account of it. This book, his absorbing travel memoir, won the Prix Littéraire Francophone in 1981. His first chapter, “The Snake in the Coconut Tree,” reads like the excellent start of an absorbing novel about African life. His uncle wanted to wake the young man to join a party of his brothers going to the nearby coconut plantation to harvest coconuts. Tété-Michel did not want to wake up and did not want to go to collect coconuts–he had a premonition that something very bad would happen that day if he went. But, on the impatient uncle’s orders, his brother filled a coconut-gourd bowl with water and dumped it on him; at last, soaked and resigned, Tété-Michel got up and joined the expedition. With practiced skill, he shinnied high up into the first coconut tree, without a rope, to dislodge the bunches of coconuts at the very top. But he also dislodged a nest of snakes. He had no weapon and few choices, when faced with the venomous reptile. He tried to avoid the snake and climb down ahead of it, but it slithered over his head and down his back–the last ten feet, he fell to the ground. It is unclear whether he was bitten or not, but, whether from venom, from venom antidote poisons, from injury, or plain shock, he soon lapsed into fever and delirium. In the next chapter, “The Sacred Forest,” he was taken deep into the territory of the python cult and its priestess. She discerned reasons she believed accounted for his condition, including seeing a dead snake in the past, and performed healing rituals. In return for this service–Tété-Michel did survive–she expected his father to dedicate him to the python cult, as an apprentice for its priesthood. The young man was horrified at this prospect. An alternative came from an unlikely place! Several stops, and some backtracking to Togo, were required before he finally booked passage for Europe on a ship leaving from Dakar, Senegal. For 6 months, he had worked as a translator at the Togolese embassy in Dakar, earning enough money to begin his trip. Throughout his travels, he was tremendously resourceful at finding kind people who would take him in to live and help him in various crucial ways, often finding him jobs. Besides working at those various jobs, he took correspondence courses in the languages he would need to master along the way. His graded papers often did not catch up with him before he had to move again, so he decided to teach himself with the French classics–from the 16th century onward! “My large suitcase eventually contained more books than clothes,” he writes. His writing talent must have emerged early, as he kept extensive journals on his trip, which took quite a few years and much patience. A French friend that he made encouraged this writing, suggesting that his perspective, derived from a traditional African culture, would shed new light on Eskimo customs and make his comparative observations uniquely interesting. At last, he reached Copenhagen, picking up Danish during a three-month delay while he waited for a visa to enter Greenland (his French ministry friend helped him get the authorization). In all, it had taken 8 years since he first left Togo to get this far. The book turns now in Part II to a new chapter in his life, “The Call of the Cold.” As he intended, the sea voyage allowed his body to adapt to dropping temperatures gradually. On June 23, he saw his first ice floes: “Some were white, others green or blue. A brilliant sun, cold as steel, glittered on them and transformed the sea into a fairy-tale world: a vast ice-blue expanse strewn with great chunks of crystal” (p. 79). Four days later, they landed at Julianehåb, or K’akortoq, “the White One.” With a natural sense of the dramatic, he prepared to disembark and make his entrance for the Inuit people gathered at the dock, who had not seen a black man before in person. But Tété-Michel Kpomassie was quite welcome among the adults who vied to give him a place to stay, their customary hospitality salted with a keen curiosity about him. From then on, he was simply called Mikili (nickname for Michel or Michael) by those he met in Greenland. He made friends readily in all but a few exceptional cases during his time there. As with most travelers to a very different place, the most difficult adjustment was the unfamiliar food. Food preferences and aversions are learned in childhood and adults are less adaptable, but necessity teaches even adults. His first host family prepared a large plate of raw whale skin and seal blubber! He did his best with it; in his book he confesses that his revulsion at first was so great that he considered getting back on the Danish ship still at port. He asked himself, “Could I suddenly give up what had taken me so long to achieve, just because of a bit of raw whale skin?” No, he decided, and the process of learning and adapting to the local lifestyle began in earnest. Mikili arrived in summer, when the midnight sun kept people restless and active all night. In the days he was taken on endless rounds of coffee visiting, and at night to dances among the young people, who did plenty of drinking. On another day he chose to visit the residents at a home for the elderly. This scene in particular was very touching to me because of his deep interest and respect for all the people he met there. After a few weeks in this southern coastal town though, he lamented the continual dancing and drinking parties that occupied the young people, along with their casual sexual pairings, as it seemed to him. He is honest too about his own behavior at that time, admitting that he indulged in some sexual relationships with girls there; however, he was troubled and frankly perplexed by the rapid swapping of partners, and felt the sting of jealousy. He wished to move farther north to “the Greenland of my dreams. I wanted to live with the seal hunters, ride in a sledge, sleep in an igloo” (p. 112). Anyone reading his memoir up to this point will have no doubt that if he can find the means, he has more than enough determination to do all these things. By the time he reached Jakobshavn, its port was beginning to freeze and he realized he would have to winter over in this town before he could ship out again to his dreamed-of destination of Thule in the far north. In the end, he made it only as far north as Upernavik, but his life there, staying with the family of Robert Mattaaq in their small cottage, provided some of the most moving and thoughtful passages in this book, which displays those qualities abundantly throughout. I most admired his willingness to share very Spartan accommodations with his hosts. While he noticed the hardships of poverty, the lack of sanitation or comforts, he never judged people by their physical situation but by their character. In one instance, he willingly chose the home of a poor, even outcast family over the grudging offer from a richer resident who had snubbed him earlier (and remained rather mean-spirited). He observed his fellow human beings with clarity and honesty, but always with compassion and respect. Reading his reminiscences made me wish to emulate his outlook in the face of difficult circumstances. And that is exactly what he did. He wrote this amazing memoir, which was published in France in 1977. As I mentioned earlier, it won the Prix Littéraire Francophone International in 1981. The English translation I read was done in 1983. Kpomassie lives in France, but travels and speaks widely. I loved finding this recent picture of him, speaking to the Bergen (Norway) Student Society in 2011. I wish to thank Aarti Chapati for recommending this book in the Diversiverse reading event organized by her. Her review of the book inspired me and I made it one of my reading goals for the event–it has taken me a while to finish and write about it. Do read her excellent review of the book at her blog Booklust. And I wouldn’t have found Diversiverse if it hadn’t been for Becca of I’m Lost in Books and Tanya of Mom’s Small Victories, who hosted their Travel the World in Books readathon with such warmth, energy, and insight. This book is also part of my participation in Nonfiction November! Aarti Chapati’s excellent review (at Book Lust) of An African in Greenland. Call of the Deep North: “Palace of the Snow Queen” by Barbara Sjoholm. The Palace of the Snow Queen: Winter Travels in Lapland by Barbara Sjoholm. Shoemaker & Hoard, 2007. Author Barbara Sjoholm makes her winter travels in Lapland personal from her first pages, where she confides her deep sadness and restlessness after a breakup with her long-term partner. These two emotions propelled her to undertake a difficult journey north, first to Kiruna, Sweden, and nearby Jukkasjärvi, the site of the famed Icehotel. In the end, she will describe three trips to Lapland, or Sápmi, inhabited by the Sami people, lands which stretch across the northern portions of Norway, Sweden, Finland, and even into Russia. She is very conscious of author-travelers who have preceded her to these regions, and she repeatedly compares and contrasts her impressions with those of the British travelers Frank Hedges Butler, Olive Murray Chapman, and Norah Gourlie, whose published journals she includes in her helpful bibliography. She is a journalist at heart, in both senses: one who keeps a careful journal of experiences, and a reporter who wants to dig for the story behind appearances. Her reporter instincts will lead her to track down information about the tense relationship between the growing winter tourism and the local inhabitants. But I’m getting ahead of things; let’s first savor her bellwether experience visiting the Icehotel while it was under construction in mid-November. Sjoholm arrived in Kiruna, an iron-ore mining town, and by her own admission, couldn’t wait to leave it and get on with her trip to Jukkasjärvi. When she told the receptionist at her hotel in Kiruna that she was staying only one night, that lady felt obliged to let her know the Icehotel wouldn’t be open for a while. Apparently, not many people make the trip early to watch the artists, architects, and ice sculptors at work on creating the multi-room hotel of ice. Sjoholm lived among what amounted to an artists’ colony for a good portion of the time it took to make the structure and finish the lighting and other interior decoration. She learned about the construction process and reports it in fascinating detail. The Icehotel uses principles learned from both ice-block fortresses and igloos, with their perfect insulation caused by heating and refreezing of the inner surfaces. Blocks of ice are cut in spring from the Torne River, stored, and used for some basic construction tasks, and for ice sculptures. For unusual shapes, snow (or “snice”–a specially made mixture of snow and ice crystals) can be cast in molds with a reinforced frame. On the igloo model, a blowtorch is used to melt the snow and ice surfaces and create a glassy coating. I especially liked the process of “sneezing” or spraying snice on the walls for a final smoothing. The author likens the frozen building material to concrete, or even stone and mortar: ice is the stone and snow is the mortar. Of course, the snow eventually compacts and turns to ice, adding even further to the hotel’s solidity and strength. Sjoholm was amazed at what the artists envisioned and what they achieved. Besides the guest rooms, the main reception hall, chapel, Absolut Ice Bar, and hallways are showcases for creativity. Since the hotel is built at the start of each winter and melts in spring, it is different each year, but here is a little gallery of representative rooms (click thumbnails to enlarge; further details on photos at Icehotel wiki). Icehotel Main Hall (2014) by Alessandro Falca and AnnaSofia Mååg. The suite “The Banished Dragon” 2008 by Valli Schafer and Barra Cassidy. Main hall in ICEHOTEL, 2007. Sculptures by Jörgen Westin. You can see more room photos at the Icehotel website–if I were going to pick a room for myself, it would definitely be the Northern Lights Room! The building is lighted by cool LED lamps and colorful fiber optics embedded in the walls. The room ceilings are catenary arches for the best stability and longest life of the structure as it melts. It was clearly a marvel of frozen engineering, but also a place of imagination and romance–no accident that she packed a copy of Hans Christian Andersen’s fairy tales, and read and reread “The Snow Queen” during her stay. After the surreal tranquility of the Icehotel interiors, Sjoholm traveled farther north into Norway, talking with more people including writer Laila Stien, and then embarked on the very unsettling outdoor adventure of dog sledding! It was so physically demanding that she fell off several times; between injuries and the extreme cold, she decided to cut short her dogsled tour and recover in a friend’s home. Although her tour was conducted and managed by a Sami tour company, she learned that dog sledding is not native to this region (being more suited to Greenland and other parts of the Arctic) and it encroached significantly on reindeer herding land. I learned from her investigation that reindeer will not cross trails that the dogs have been traveling, which presents obvious problems for their healthy coexistence in the same territories. Sjoholm is dogged (if I may be allowed the pun) in her reporting, talking with people holding varied viewpoints and discovering the nuances of local customs and politics, but her sympathies clearly lie with the Sami, who have occupied this land for 6,000 years but have had to struggle for full political rights. Many, but certainly not all, continue to herd reindeer, albeit with some modernized methods, such as tracking the herd’s grazing patterns via computers and GPS. I have hit only a few of the highlights from her three trips to the deep north. Don’t miss her stops in Finland at Santa’s Post Office in Rovaniemi or at the Ice Cinema in Inari. But above all, her wonder and changing views of the Palace of the Snow Queen serve to frame her experience. When she returned at the end of her third trip, she appreciated the mining town of Kiruna much more, staying there longer, roaming its streets to discover every corner and meet many of its residents. It was April, the last weeks before melting would make occupancy of the Icehotel unsafe. She took the opportunity at last to stay overnight in a room. Once again, it wasn’t quite what she expected, but she described the strangeness of sleeping in a room of ice so well, I reached for an extra sweater! Highly recommended reading. I hope I can see it, and shiver there, myself someday! Kerstin Ekman’s Under the Snow stretches the police procedural genre–or rather, freezes it–to fit its setting: a tiny Sami village on the Arctic circle in Norbotten County, the northernmost county of Sweden. Constable Bengt Torsson is called to investigate the death of art teacher Matti Olsson, at the small Rakisjokk Nomad School, situated at the far west end of a long, narrow lake. The school exists only for the Sami children, and the few Swedish people in the village are those doing weather measurements, teaching at the school, or managing the occasional tourist trade. This setting couldn’t be more different from that in another Swedish detective novel, The Laughing Policeman by Sjöwall and Wahlöö, which took place in the crowded urban setting of Stockholm. The crimes in that novel took place on a double decker bus, whereas the only ready transportation to reach the Rakisjokk school is a set of skis! Torsson must ski across the frozen lake in March, with his guide Henrik Vuori, to begin his investigation. Ekman’s descriptions are as stark as the setting and she has a talent for making striking observations. According to them, an intoxicated Matti had simply wandered out into the snow and died before they discovered him the next morning. Torsson stayed on several days and found some evidence that didn’t seem to fit this simple picture–a mah jongg tile stained with blood, for example–and he painstakingly interviewed all those connected with Matti, but in the end, he couldn’t bring it into clear focus and went away unsatisfied. A few months later, in July, one of Matti’s friends, David Malm, decided to visit his friend unexpectedly. On his way to Rakisjokk he encountered Anna Ryd who seemed to be in a hurry to leave–all she had in her car was a bark knapsack. Her car had hit a reindeer, and he tried to help her. She flatly told him Matti was dead, with a warning to turn around and forget about inquiring any further: “He wasn’t what you thought he was” was her only explanation. David sought out Torsson and persuaded him to return to Rakisjokk to confront the evidence that didn’t add up and discover the truth. David is an eccentric character himself–like Hamlet, he feigns a bit of madness to shake people up and shake out their secrets. The pace of this already taut story really picks up from here on. It may seem as if I’ve told a lot of spoilers, but what I’ve described so far is all over in the first third of the book–much more will happen and be revealed. Despite this book’s title and my expectations, the descriptions of extreme cold were not its most prominent feature for me. Rather, the wound-up emotional tension and fear of discovery were even more palpable. Imagine an English country house murder being transported to a wilderness schoolroom with few comforts, except for ever-present hot coffee and layers of thick clothing, but the people inhabiting it were just as tight-lipped. Torsson is not a Poirot laying out the single-handed solution with a dramatic flourish, but rather a persistent facilitator of the truth, which emerges when some of the participants become ready to face it. Ekman has such a sure hand with her prose that one genre is not enough! She has given a fascinating video interview where she describes her philosophy of writing and her experiments with several genres. I look forward to exploring some of her other novels, which include fantasy (The Forest of Hours), historical fiction (God’s Mercy), and more mystery (Blackwater). This book counts toward this year’s #FrightFall readathon at Seasons of Reading, hosted by Michelle of The True Book Addict, and toward the ongoing Travel the World in Books Challenge, hosted by Tanya at Mom’s Small Victories. Eric Ewazen – “Northern Lights” for solo marimba. Performed by Matt Moore on March 24 2011. Beautiful sound, isn’t it? It really does evoke the shimmering, curtain-like beauty of the Northern Lights. Eric Ewazen is a composer and teacher at Juilliard. The Laughing Policeman by Maj Sjöwall and Per Wahlöö, trans. Alan Blair, Random House, 1970. The Martin Beck series by Maj Sjöwall and Per Wahlöö changed the scope of detective fiction in Sweden, adding social criticism (of the 1960s and early 1970s, when these novels were written) to the puzzle-solving aspect. According to Henning Mankell, creator of Inspector Kurt Wallander, the Sjöwall and Wahlöö books inaugurated “Nordic Noir” and paved the way for his own series and for the celebrated crime novels of Stieg Larsson. In The Laughing Policeman, a big, red double-decker bus halts at the end of its line, and all its passengers are dead, gunned down by an unknown assailant. Among them is Åke Stenström, a young policeman, whose mysterious activities become the focus of the investigation. Readers must wait for the last page, the last sentence, to discover who laughed and why. This is my first Martin Beck novel, but the fourth in the series. I know I will be going back to read all 10 of them. The writing is superb, and the best thing about them is that Martin Beck, a quick-witted, deep-thinking man with a chronic cough and a frayed marriage, is not the only memorable detective! The whole homicide squad makes an appearance and each does his unique part to solve the case. Sten Lennart Kollberg stands out in this one–the chapter where he interviews Åsa Torell, Stenström’s widow, was the most riveting. He and Beck are close friends, in the rather uneasy way that men in difficult jobs can sometimes have. Over the years they [Beck and Kollberg] had become more and more dependent on each other in their work. They were a good complement to one another and they had learned to understand each other’s thoughts and feelings without wasting words. When Kollberg got married eighteen months ago and moved to Skärmarbrink they had come closer together geographically and had taken to meeting in their spare time. I am exploring the whole Nordic Noir phenomenon, and I’m glad I have begun with this superb example. I will probably go back and start at the beginning with Roseanna. If you have another favorite in the series, please leave a comment to let me know! “The queen of crime” [profile of Maj Sjöwall, her writing partnership, and the Martin Beck series] by Louise France, The Guardian/The Observer, Nov 21, 2009. Daughter of Fire: A Portrait of Iceland by Katharine Scherman, Boston: Little, Brown and Company, 1976. Whenever I hear just the word Iceland, I feel exhilaration. I picture broad flat terrain, nearly treeless, punctuated by some flat-topped volcanoes and bubbling hot springs. I picture yellow wildflowers as far as I can see and a view over a clear ocean bay. I picture glaciers and I imagine coldness. Not a painful feeling, though my mind knows that Iceland’s fierce winds and dropping temperatures in winter can be rough on a human, but in my mind, it’s a bracing coldness–the kind that makes you open your eyes wider and breathe more deeply to feel the bite of the air. Katharine Scherman’s classic book on the geography and history of Iceland certainly fed my imagination. To my mental scene, I added wheeling eagles and gulls, fulmars (a sea bird), auks, puffins, and plovers. I could imagine the black or gray basaltic sand beaches , and I learned the word tephra, for all the ash, pumice, and explosive lava spray that vaporizes and settles back in layers on the earth, enough to bury a whole town. Heimaey is an island off the southwest coast of Iceland (but east of Reykjavik), and tephra buried its main town in January 1973 when the long-quiet Helgafell volcano erupted. When the eruption started, the few thousand inhabitants were moved by boat to the mainland; they were luckier than the people of ancient Pompeii. Amazingly, a year later, 900,000 tons of debris and ash had been removed from the town and most people had returned to the island. Where did they take all that ash? Scherman says it was used to lay the foundations of miles of new roads and also to extend the harbors. Scherman and her husband traveled throughout the country, and her travelogue is full of careful observation of the land and the creatures inhabiting it. She divides the island into three portions, providing a nicely detailed map of each at the head of its section, then proceeds to teach the reader in beautiful lucid prose about the geology of the region, about its history and connections to Iceland’s sagas and other arts, and about the lives of some of its modern town and country dwellers. South Iceland (chaps. 1-6) has the volcanic islands Surtsey and Heimaey, and the modern capital Reykjavik. West Iceland and the Northwest Peninsula (chaps. 7-15) is the most varied region she explores. Since the time of Scherman’s book some efforts have been made to have ecologically sustainable fishing in the areas off the Northwest Peninsula, and the decline in yields has been slowed or halted. But I suspect that the competition is still too fierce for small fishermen. Still, I was grateful to read Scherman’s accounts of meeting Peter Petursson, an older fisherman who kept a family home at Hesteyrarfjord (Horse fjord), and Gudmundur Sveinsson, who owned a fishing-net factory in Isafjord. The third region, Northeast Iceland (chaps. 16-17), contains some important rivers and glaciers as well as the interior desert plateau that only adventurers crossed. Part of that wilderness, called Odadahraun, was associated with the saga of the outlaw Grettir the Strong, who had battled trolls and ghosts but ran afoul of ordinary men. Its gorgeous panoramic photos, taken by Scherman and her husband, presented in many two-page spreads. These black-and-white images seem perfect for Iceland’s geological story, a peaceful window onto a rather turbulent landscape. The photos dramatize this change particularly well in the case of Heimaey, which Scherman visited before and after the volcanic eruption buried the town in its path. Scherman’s translation of all the place names on first mention, showing their clear logic in the nimble Icelandic language. By the end of the book, readers should know that jökull means glacier, foss means waterfall, floi means bay, fell means mountain, and fjord–well, we already knew what fjord meant. Helgafell is Holy Mountain, Snaefellsjökull is Snow Mountain Glacier, and on and on. I realize that the book is nearly four decades old; the chapter on Iceland’s Cold War politics was particularly dated, if nevertheless interesting as a time capsule. But most of it reads as very contemporary indeed, given the 2010 eruptions of the tongue-twisting Eyjafjallajökull, the glacier that covered a volcano, and the ominous fissure eruptions of Holuhraun this month! I am happy to have this book be my first review as a participant in the Travel Around the World Challenge and this month’s Readathon. Daughter of Fire is available, both new and used, at online booksellers; I got my copy at my local public library. I wanted to add a link here to A Reader’s Respite who has a guest post at Mom’s Small Victories. She describes so well, from her own experience, how traveling the world in books begins with that first library book, and it never has to stop! Thanks to the Challenge and Readathon hosts, Mom’s Small Victories, I’m Lost in Books, and Savvy Working Gal. 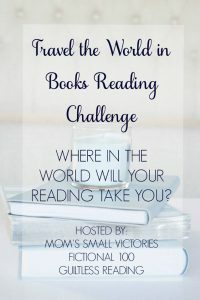 Since I’m joining the Travel the World in Books Challenge at the time of its first Readathon, this post will serve to outline my goals for both events. My thanks to Mom’s Small Victories, I’m Lost in Books, and Savvy Working Gal for hosting this challenge and readathon. I am planning my Challenge reading goals to intersect with much of the reading list that is taking shape for the Northern Lights Reading Project as a whole–literature, history, biography, travel, and food writing, which relates to Iceland, Finland, Denmark, Norway, and Sweden. These are places I would love to visit in person, but for now, I will travel via reading and appreciating some of their major landmarks in fiction and nonfiction. Books by authors from these countries have a high priority on my reading list, but other fiction and nonfiction books that take these countries as their subject are included. I’m planning to read 40 books in 5 years, or 8 books a year, for this challenge. I may be able to finish more, but with work and other reading/reviewing commitments, this seems like a good place to start. I will keep track of my Travel the World in Books progress with a Goodreads bookshelf (although I must say I love the method suggested by Tanya of Mom’s Small Victories–charting her reading on a personalized Google map). But Goodreads is the way to go for me, because I can post brief reviews of qualifying books. Longer book reviews will appear here on Northern Lights or over at my other blog, The Fictional 100. Why so much crime fiction? Detective fiction and police procedurals have emerged as the most characteristic genre writing in Northern countries, enough to have acquired the name, “Nordic Noir.” Crime fiction reflects the presence of crime in a society and critiques the conditions that engender it. It minutely examines human motivations and, most of all, provides a laboratory for putting human values to the test. As philosopher Walter Kaufmann has written, “life at the extremes” tests our moral reasoning, forcing us to discover what we truly value and whether our picture of the world is true or not. Ever since Dupin and Holmes, solving crimes in the fictional world has affirmed human and societal values in the real one, and provided an arena where rationality could contend with the wild and irrational. Whether rationality wins (in traditional detection) or loses (in some postmodern alternatives), something profound is learned about what we hold dearest. Even disappointments and failures can teach us that. Injustice can only be felt within an implicit ideal framework of a just world. The persistent emphasis on the personal flaws of the detectives themselves, their quirks or aberrations, affirms the value creation even more. The effort to gather evidence, to pursue truth and justice, transcends the detective and his or her weaknesses. While those weaknesses may impede the restoration of essential order and values, they also elevate the tragic sense in their pursuit. In Nordic literature, the preoccupation with crime and justice is nothing new. The Icelandic sagas, in particular, contained the most brutal of crimes and countercrimes, done in the name of justice and retribution. These stories were born in the microlaboratory of a “new” society, with its government by chieftains and the Thing, for hearing and resolving grievances, and then meting out suitable punishments. Therefore, Nordic Noir–modern as it is in its details–represents continuity with a longstanding literary tradition concerned with reestablishing justice in the face of some appalling human behavior, all played out in stark settings more or less isolated by climate and geography. My reading list for the Northern Lights Reading Project includes detective fiction by Maj Sjöwall and Per Wahlöö, Henning Mankell, Kerstin Ekman, Yrsa Sigurðardóttir, Arnaldur Indriðason, Helene Tursten, and, of course, Stieg Larsson.